General view of the Mercosur trade bloc annual summit in Luque, Paraguay, June 18, 2018. Leaders of South American trade bloc Mercosur pushed for trade deals with Asian and other Western Hemisphere countries during a summit on Monday, as roadblocks remained in talks with the European Union (EU) despite optimism earlier this year. European officials said earlier this month that talks for a long-delayed trade agreement with the Mercosur bloc of Argentina, Brazil, Paraguay and Uruguay were nearing a close. But Uruguay's President Tabare Vazquez, who assumed the bloc's rotating presidency, criticized delays in negotiations. "We are not prepared to waste time in eternal negotiations," Vazquez said in a speech. "Nor are we prepared to sign a watered-down version." The last round of EU-Mercosur talks in April ended with limited progress and finger-pointing about who was holding up a deal. Key gaps remain on how far to open each other's markets to industrial goods and farm products, such as Latin American beef and EU cars and dairy. The Mercosur countries emphasized in a joint statement on the need to "have the political support from both parties" to reach a deal. 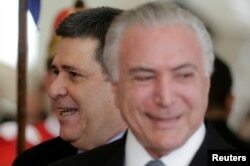 Paraguayan President Horacio Cartes smiles next to Brazil's President Michel Temer at the Mercosur trade bloc annual summit in Luque, Paraguay, June 18, 2018. "We should not abandon the idea of this alliance," Brazilian President Michel Temer told reporters. "Closing the doors now would impede negotiations which recently have had reasonable success." Temer also pushed for trade talks with the neighboring Pacific Alliance countries of Chile, Colombia, Mexico and Peru, which are generally far more open to international trade than their Mercosur counterparts. A meeting between the two blocs is scheduled for next month. In the joint statement, the bloc described recently launched trade talks with Canada and South Korea as an "assertive response against protectionist tendencies." Argentine Vice President Gabriela Michetti also called on the bloc to "advance quickly" in talks with Singapore, India and North Africa.